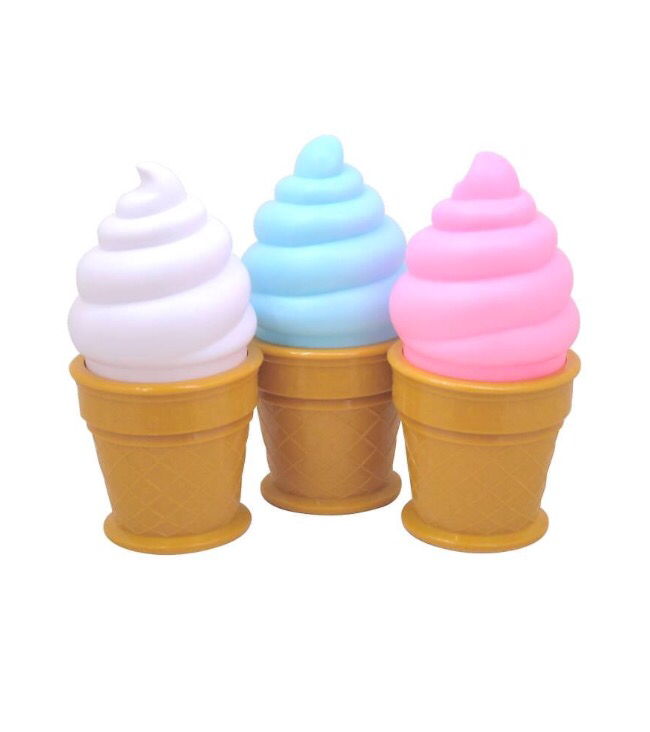 Always a massive theme in summer, icecreams are prevalent in kids interior style in many different guises. 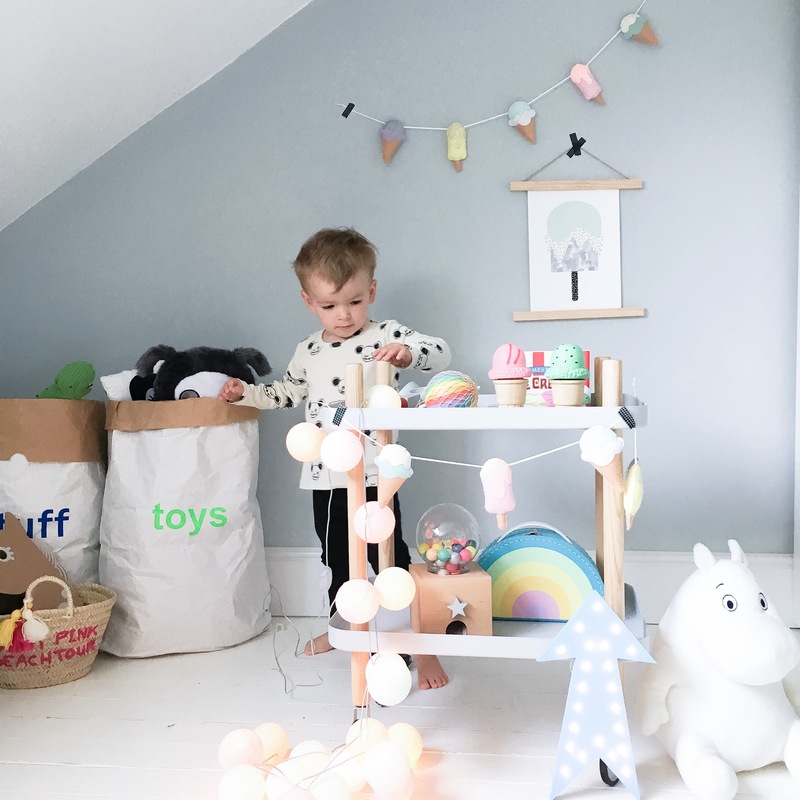 I’ve put together this post all about sourcing the very best Icecream play things and interior accessories to swoon over, both kiddo and adult friendly. One rainy Sunday, I created a make believe Icecream parlour for my boys. 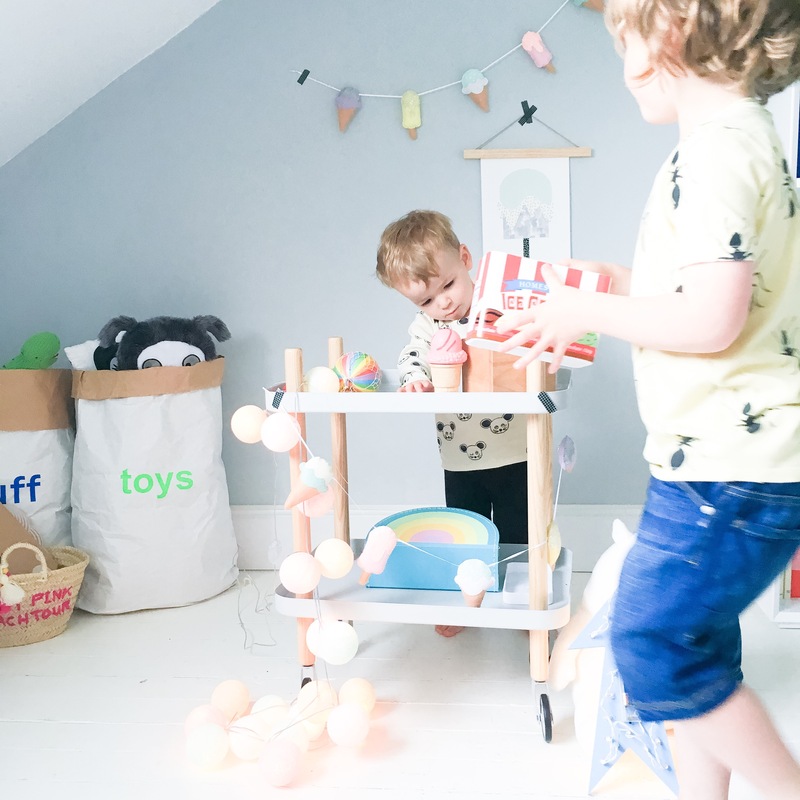 We just used our simple metal Normann Copenhagen trolley (I found ours via Bodie + Fou shop) and strung it up with our cotton ball lights in pastel colours. A while back we had visited a pop up cafe where there were some fun wooden icecreams, so I tracked them down. Ours are by Melissa and Doug and proved very popular with the boys. We just googled it and found them for around £20 online. 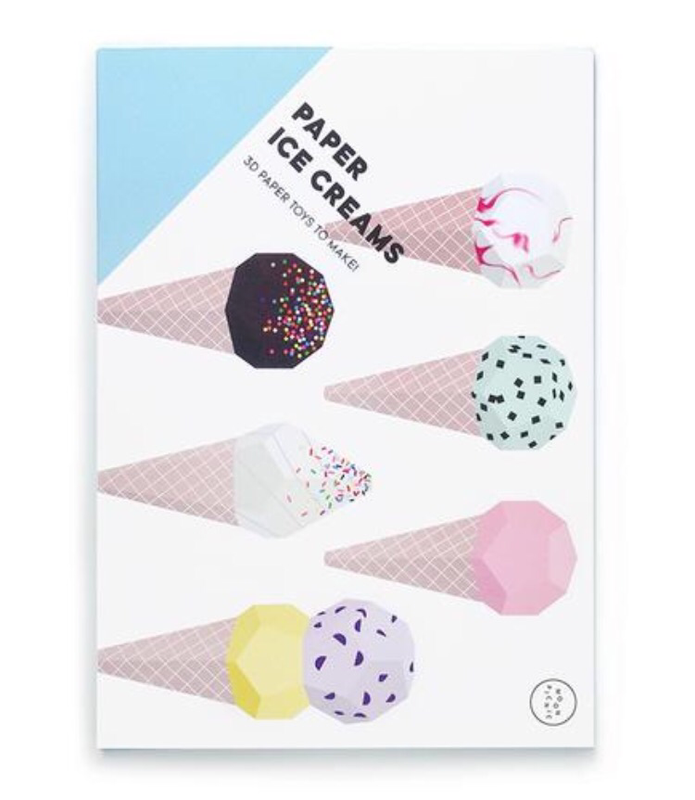 I’ve also come across some equally gorgeous Icecream toys that are sure to spark your small people’s imaginations, from foldable paper icecream kits from Moon Picnic at £15 which would be a fun rainy day activity but perhaps for older children who are a bit more careful! These, once made up would be fun to string up in a bundle on some fishing wire in a corner, or add a couple to a stylish shelf display. Also coveted is the most beautiful wooden set by Nobodinoz at Molly-Meg which at £60 is more of an investment but it is stylish and extremely design led. 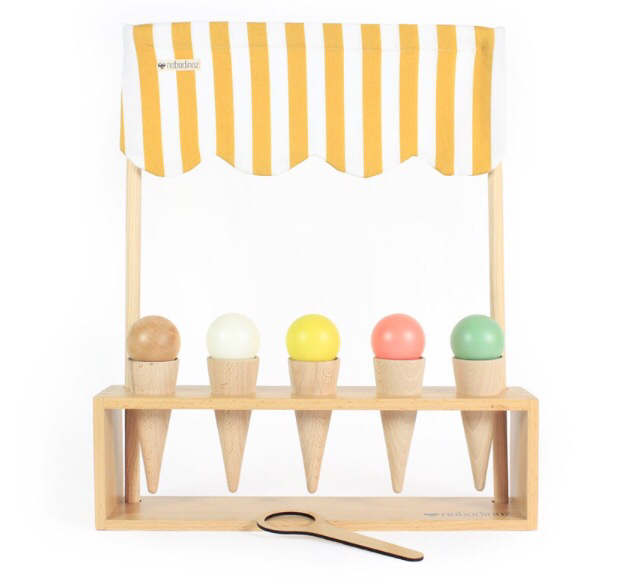 Icecreams are also prevalent in the world of kidsinterior and are fun to mix and match a couple of pieces to add some flair to a kids bedroom, especially when combined with white walls or floor and some pops of colour and texture. 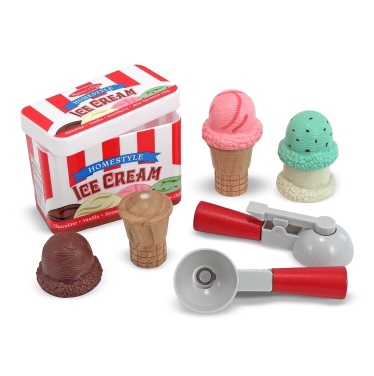 The key is not to go overboard, just add a combination of a few Icecream themed products and then dot in other pastel toys and accessories. 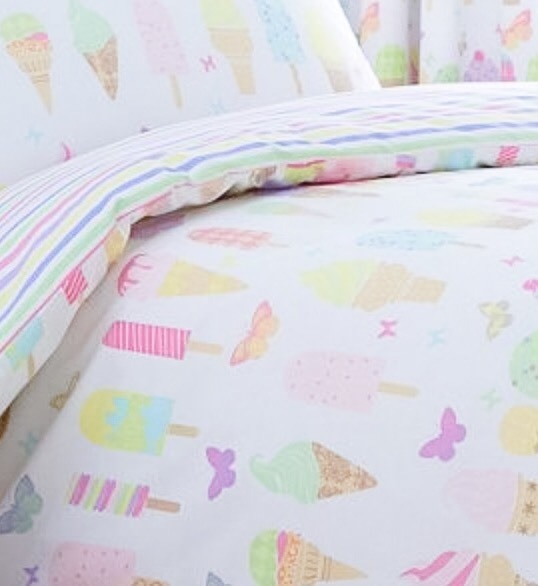 We found this pastel Icecream bedding via Debenhams and prices start from a bargainous £22 for a single set. As there’s so much going on with this pattern, I’d suggest you keep walls and flooring light and simple and perhaps add a plain knit/quilted throw in a more luxe material strewn over the bed to tone it down. I adore this cushion by Colette Bream, it’s firmly on my own personal wish list as its so sweet and not too sickly. 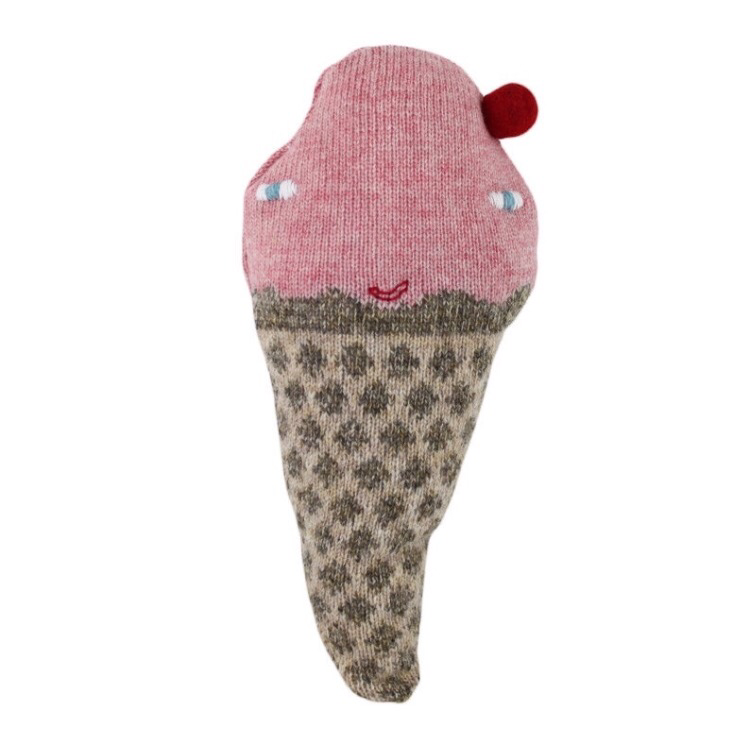 Colette has a beautiful Etsy shop full of characters, and selected styles including this one are also available through Scandimini in the UK. Wanting to update existing bedding or add some pastel flair to your pushchair (and have a conversation starter as people admire your pram blanket) ? Then these knitted blankets by Woouf at This Modern Life at £49 are extremely covetable and come in some varied colour ways. 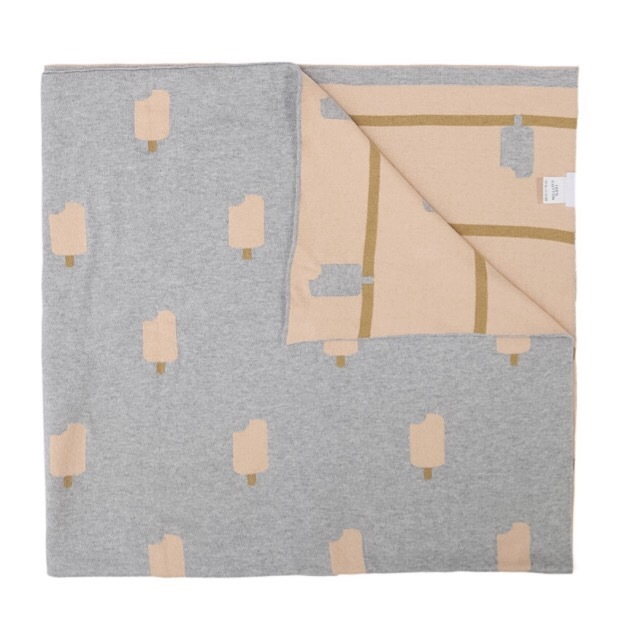 The perfect prints for any pastel Icecream inspired room are from Wonder and Rah. 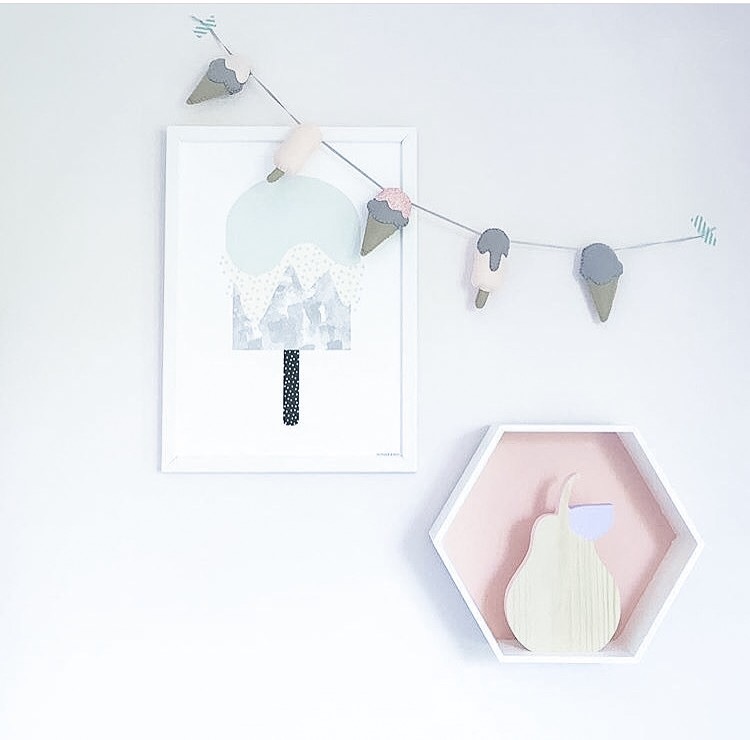 They blend Icecream sweetness with a dash of Scandi styled monochrome and look great in frames or in wood picture holders (as seen in the background of our Icecream parlour pictures). 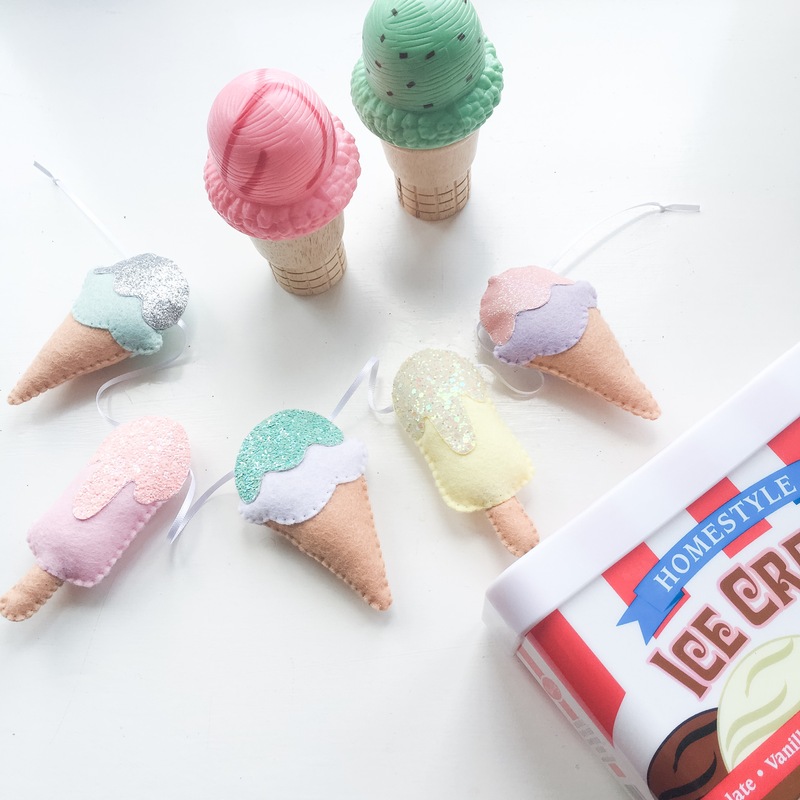 wonderful capture of our icecream garland and print by Wonder and Rah by LaLaLoves Decor. Finally, I couldn’t resist adding in this cute print by Milk Moustache Apparel and these sweet baby shoes by Kirsty Doyle. Vests start at £13 and come in this pink colourway or in mint and the little shoes start at £22. 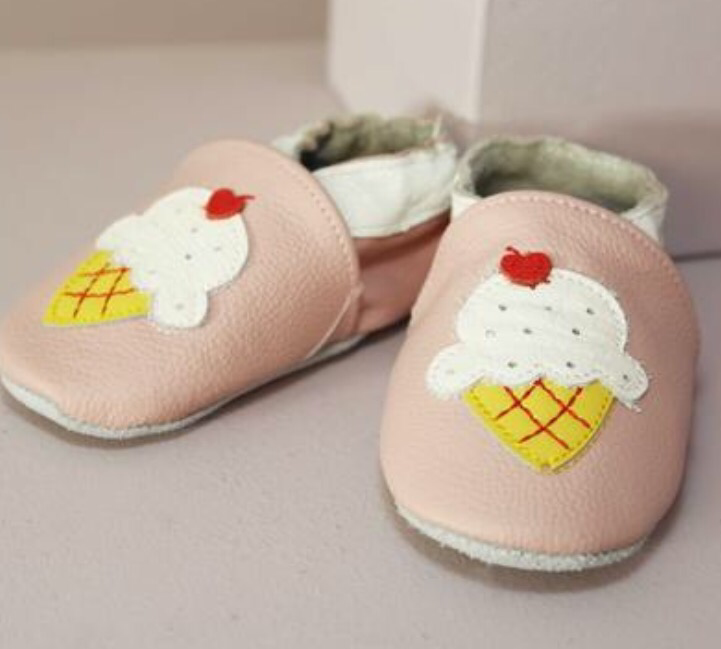 A top tip for an Icecream themed room or a sweet nursery is to use your baby shoes as a shelf ornament. Not only would these shoes look very lovely on, they would also be perfect sat together on a wooden shelf with other wood and pastel accessories and one of our garlands strung nearby. 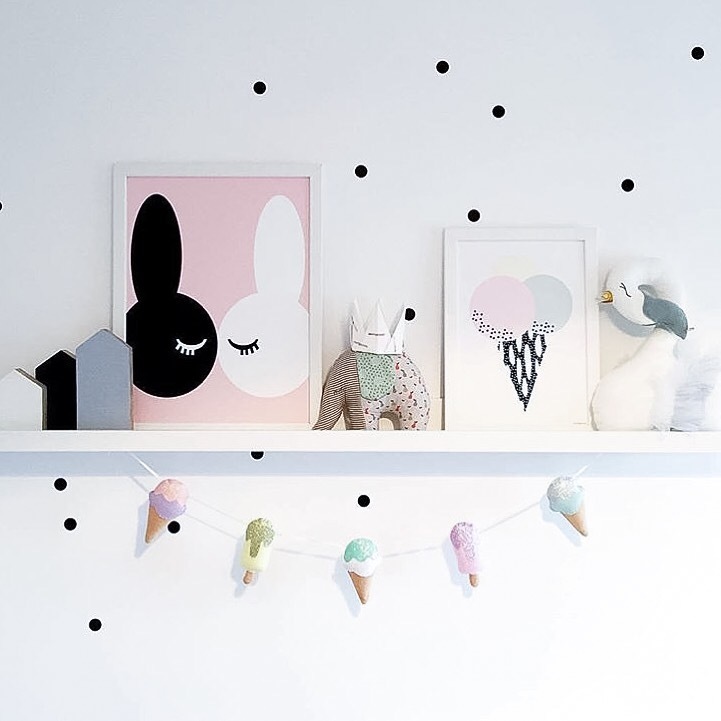 The shelf capture below makes perfect use of our Icecream garland and beautiful prints from Wonder and Rah.